The JReviews extension for Joomla includes everything you need to get started. Easily create sites for business directories, classifieds, catalogs, events, reviews, multimedia, and much more! As soon as you start using JReviews, you'll quickly realize that it is both the best Joomla directory component and the best Joomla reviews component, combined into in one powerful and user-friendly solution. JReviews is in constant development with a strong emphasis on user experience, SEO, and performance. You can use JReviews to build City Guides, Classifieds, Business Directories, Product Catalogs, Book Reviews, Events, Movie & Gaming Review Databases, Job Boards, Beverage Reviews and so much more. JReviews for Joomla extends the core Joomla article system; it's extremely flexible and comes with unparalleled features and functionality. One-click installation of sample data makes getting started with JReviews a breeze! Create custom Advanced Search and Filtering Modules to let your site visitors quickly find what they are looking for, including the ability to search listings by rating. You can design multiple forms with different inputs or let users use the default Advanced Search page where they can search listings by listing type, category and the defined search fields. When combined with the GeoMaps and MapsPro Add-ons the Advanced Search and Filtering Modules are also capable of performing proximity searches using postal codes, partial or complete addresses. Review and Breadcrumbs structured data markup is output by default to increase the probability that you'll get nicer results in SERPs. 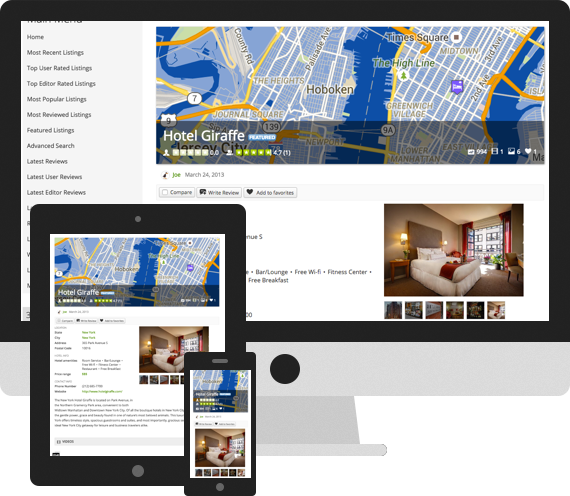 Eleven different modules are included to allow your Joomla directory and reviews site to stand out from the pack! We've also implemented a ShortCodes system that allows you to place the output of listings, reviews and custom fields anywhere on the site. MapsPro: Bring the power of OpenStreetMap, Mapbox and Google Maps to your site. Add proximity search to advanced search and filtering, show maps in list and detail pages, streetview (Google only) and directions. The add-on includes a module to display maps anywhere on your site. The features and strength of the product are coupled with outstanding customer support and backed by our 30 day money back guarantee. We release frequent updates to roll out new features and improve the existing functionality. I've been running jReviews for almost 3 years now, and I am very happy with the support and all of the new features. This component has helped my site grow tremendously. Keep up the good work Alejandro! I can't wait to try the GeoMaps addon. Great Product, Even better customer support!!!!! I have been using Jreviews for about 2 months now and I have to say that it is one of the most well thought out extensions that I have seen to date. Not only is it robust, but they have made it incredibly customizable. I have very little knowledge about php and coding, but this system has been a breeze to learn and adapt to. The reason you should buy this feature is because of the Support Forum. The moderators (in particular, Alejandro) are amazing. They not only help you with the little stuff, but often go way above and beyond the call of duty and help you customize your code. Simply incredible! The best product for Joomla! I've been using the JReviews component as the foundation for my website for 4 years. They offer the best customer support I have experienced compared to other component providers. They always help in case there's a problem and are very quick to respond. I can sincerely recommend all JReviews products!